We put M.A.C Studio Fix Fluid SPF 15 to the ultimate test of seeing how long it wears and, not surprisingly, the formula lasts for a full 24 hours! This modern foundation combines a matte finish and medium-to-full buildable coverage with broad spectrum UVA/UVB SPF 15/PA++ protection. Applies, builds and blends easily and evenly while controlling shine. Comfortable and extremely long-wearing, it helps minimize the appearance of pores and imperfections, giving skin a smoother, more flawless look and finish. Explore the entire range of Foundation available on Nykaa. 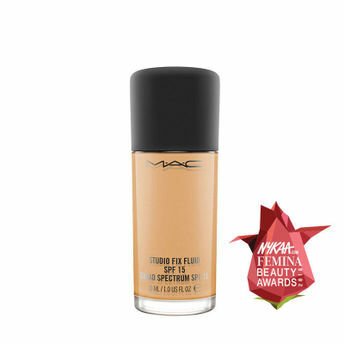 Shop more M.A.C products here.You can browse through the complete world of M.A.C Foundation .Alternatively, you can also find many more products from the M.A.C Studio Fix Fluid SPF 15 range.